The Apostle Jude in a brief but terse letter to the early church warned pastors and elders that Jesus was both Master and Lord! Master and Lord! What does that make of every believer? Like the Apostles Peter and James and John, we should probably consider ourselves “bond-servants” of Jesus Christ. Jude described those who challenged the faith in his time as those who had “crept in unnoticed…who pervert the grace of our God into sensuality and deny our only Master and Lord, Jesus Christ;” (verse 4) A different gospel that allows for “sensuality” (read: “total freedom of sexual expression”) and a denial of Jesus as Master and Lord; sound familiar? God’s clear standards for what is truly loving and just should trump our views of what is right and beneficial, every time. I am fairly confident that neither a plea of ignorance, nor a timid heart that fears the messiness of contending for the faith will pass muster at the judgment seat of Christ. (2 Corinthians 5:10). It is now our turn to keep the faith. At Green Hill we will not shirk our common duty to love the Church of Jesus Christ and we will stand firm to defend the faith once delivered to the saints. Heard the pastor’s report from the recent gathering of the Fellowship of Presbyterians in Atlanta. The Summer Conference was more nuts and bolts about helping congregations and church leaders learn how to become vital communities of outreach and more authentic expressions of biblical faith. Listened to members of the church who came to ask questions about the Fellowship of Presbyterians. They heard the pastor’s report and sought answers about potential benefits Green Hill might expect from being associated with the Fellowship, a new evangelical network of churches within the Presbyterian Church (USA). The Session decided to take initiative to find churches nearby in the Fellowship of Presbyterians. This way we will begin to benefit from associating with churches of like mind through times of fellowship, study, and mission. Reverend Louie Reynolds will fill the pulpit on two Sundays the pastor will be on personal leave, November 25 and December 30. Agreed to allow the pastor to preach the stewardship message for Andalusia First Presbyterian Church, Sunday, November 18. Pastor Dale Sallans of the Andalusia church will fill our pulpit the same Sunday. America’s National Prayer Committee and its member organizations are putting out a call to pray 40 days prior to the November elections. We are in desperate days as the spiritual, moral, and financial fabric of our nation is disintegrating around us. Believers need to pray as never before. The United States is clearly a nation in trouble. A battered economy, political divisiveness, the culture wars, racial uneasiness, and a sidelined church, provide the dry tinder for an inflammatory national election. Many stake their hopes or fears on the outcome. While believing in and encouraging the importance of exercising our right to vote, America’s National Prayer Committee also calls the Christian Church in America to do that which is even more critical in these days . . . to pray. The seriousness of our day requires an intensity of prayer that is unprecedented. Accordingly, the Committee calls for 40 days and nights of unrelenting intercession on behalf of our nation, immediately preceding the Nov. 6 election. Beginning on September 28, and running through the election on November 6, Green Hill Presbyterian Church will participate in this call to prayer. From 4pm to 5pm every evening, seven days a week, the church will be open for our members and friends to come in and pray together. As members in the Body of Christ, we commit ourselves to prayer during these days of decision regarding the future of our nation. Whether or at home or in person, please join us in this call. Please mark Wednesday, October 3, on your calendar and plan to come to the Green Hill “Pasta & Praise” night. Dinner will be served from 5pm to 6pm and will include spaghetti, salad, garlic bread, tea, water, and dessert. At 5:45pm, praise songs will be sung. Cost is $3/person or $5/couple or family. Come enjoy a fabulous meal and enjoy the joyous praising of our Lord and Savior! I would like to express my most heartfelt thanks to you for your donation to Family Services. The $1,000.00 you gave us is helping us to continue serving the community until stable grand funding can be found. We are so grateful to you for investing in this important work! We are all grateful to you not only for this donation but for all the ways that you partner with us and assist the families who are most in need in our community. I don’t think you will ever know just how many lives you have touched and how many children are safer today because of your generosity. God is truly working miracles through your congregation. May God continue to bless you and all the wonderful work that you do in His name. Coffee County Family Services Center. The coordinating team has been busy laying out the activities for the coming year. The requests for helping the Presbyterian Home for Children was for homemade goodies and cleaning supplies to be delivered at the Fall Spiritual Retreat on October 6th in Dothan Al. There is a Box in fellowship Hall to receive the supplies. There will be a van going so jump on in. Dee Koza and Candasu Vernon are the speakers. They want registrations by Sept 26th. Our Bible Study was off to a good start with 10 beautiful Green Hill ladies gathering to study on The General Epistles. There was a nursery for children. Lesson two will be on October 11th. The next exciting thing will be on October 14th. – The General Membership Gathering. At 1:30 it will kick off with Music for the whole church, provided by the Frank brothers. There will a love offering that goes toward the boys’ college scholarship fund. More info to follow. At 2:00pm the women will have their business meeting to approve the mission projects for the coming year. So after lunch, come hear these gifted young men. October 19th the ladies are off to Panama City for an overnight shopping trip and time together at the Smiths beach cottage. And don’t forget to get your tickets from Gloria to sell for the Belk’s Charity Sale on November 2, 2012. See website and women’s board in the fellowship hall for more information. Items can be dropped off in the Elementary Classroom or at the church office. The kids really appreciate the support in their efforts to be “Santa” for kids who wouldn’t get a Christmas gift otherwise. These shoeboxes are distributed throughout the world with the Gospel – our greatest gift! The deadline for submissions to the November 2012 church newsletter is Tuesday, October 16. Items can be emailed to greenhillpc@gmail.com, or dropped off in the church office. Many thanks to our contributors. GREEN HILL HAS A NEW SIGN! As everyone has noticed by now, the new digital sign down by the street has been installed. Thanks to the tireless work of everyone on the “sign team” everything is now hooked up and working properly! 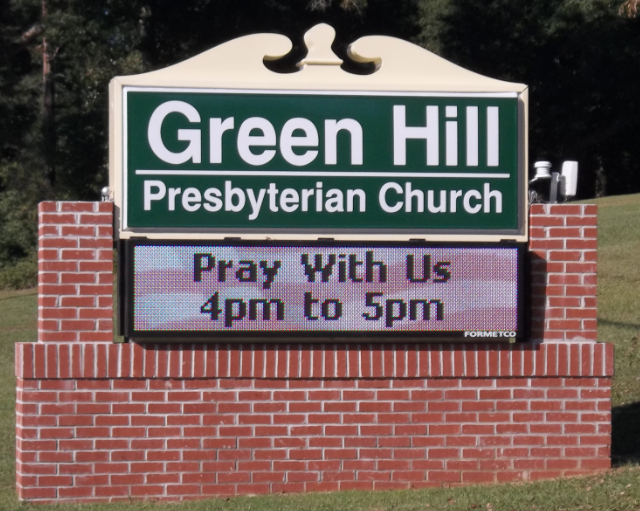 It is our sincere hope that this new sign will not only increase the visibility of Green Hill in Enterprise, but that it can be a tool for sharing information, and that it will show God’s spirit to those who pass by the church each day. Do you have an idea for a message to run on the sign? Please contact the church office, or drop a note in the basket on the office door. We look forward to hearing your suggestions. The prayers and sympathy of the congregation are extended to the family of Marie Lepore who passed away last month. She was a wonderful woman who will be dearly missed by her church family. As we look back over 45 years of service here in Mexico, and celebrate our 50th wedding anniversary, we thank the Lord because He has preserved us, has not abandoned us, and has allowed us to proclaim His power and might to the next generation. He has been faithful in our family and in the Seminary where we have served: in Yucatan for 30 years, and in Mexico City for 3. As you can read in the attached resume of our ministry, the training of the future generations has been our goal since coming to Mexico in 1967. We can now see how He prepared us and led us and has used us to further His Kingdom and help His church grow in this part of the world. This being summer, our activities were different, although weekends were still marathon trips to many villages. Daniel and family and a friend of Debbie’s, came in July to help with the wedding preparations. The wedding itself had to wait an hour for the rain to stop (it was held in a garden) but it turned out to be a lovely evening. Debbie and Rolando live 5 minutes away, so they drop by every day. Debbie is working in a private school, and also will be teaching English in the Seminary 2 evenings a week. The theology school is trying out classes from 4 to 10 p.m.; the music school continues its classes in the day. We thank the Lord, a real answer to prayer, for the 15 new theology students, and 13 new students in the music school. This will be Dan Isaac’s last year (some of you have been helping to support him). He will need $250 dollars per month for 11 months still. He has done very well. People in his home town are surprised at how well he plays. Camp was wonderful this year. Thanks to all who contributed for scholarships. There were over 150 campers each week, first for children, and then the youth week. Many decisions for the Lord were made, especially among the young people. The leaders were rejoicing over one very special night of repentance and reconciliation. Camp has been held at the present location 45 years now, but was begun some 70 years ago by Rev. 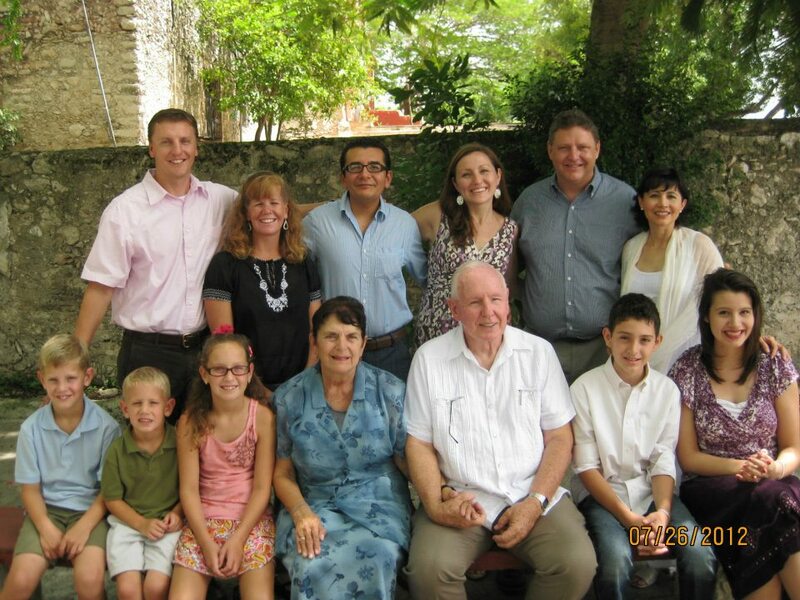 Celis, a Merida pastor, and Dave’s parents. On September 8 we celebrated our 50th wedding anniversary with a Thanksgiving musical. We were glad our 3 children could be here for this event. We say with the psalmist, “the boundary lines have fallen to us in pleasant places. Surely we have a delightful inheritance.” (Ps 16:6) Enclosed is our latest family photo. Left to right: (back row) Daniel, wife Debra, Debbie and Rolando, and Mark and wife Altia; (front row) Daniel’s three: Caleb, Owen and Alyssa; Jean and Dave, and Mark’s two: Johnny and Ellie. We missed not seeing some of you this summer, but look forward to traveling to the States a year from now. Thank you so much for your gifts and prayers.